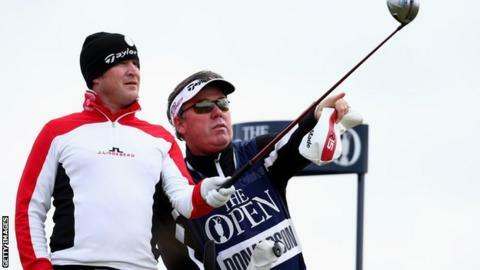 Jamie Donaldson hopes an earlier start on the second day of the Open will help him close the gap on the leaders. The Welshman ended his opening round on level par, shooting a double-bogey on the 17th hole as strong afternoon winds hampered playing conditions. He starts his second round at St Andrews at 9:22 BST on Friday, seven shots behind leader Dustin Johnson. "I played nicely but it was difficult. We've got to let the draw even itself out," said the 39-year-old. "Anything under par in the afternoon you'd be happy with. It's a shame but level par is not disastrous and we need to go and take advantage of, hopefully, half-decent conditions in the morning." Johnson was one of many players who took advantage of calm weather on Thursday morning, posting a seven under par opening round of 65 to upstage playing partner and Grand Slam-chasing Jordan Spieth. Strong winds made playing conditions trickier in the afternoon and evening, with the others in Donaldson's playing group, Keegan Bradley and Yuta Ikeda, three and two over par respectively. There is wind and rain forecast for Friday and Saturday, which could make life difficult for the players, though Donaldson is hoping a morning start to his second round will aid his bid to climb up the leaderboard. "We've got to hope it's similar [to Thursday] and, if it's not, we've got to play really well," he added. "There was no wind this morning. It was still. In the afternoon it was blowing and you just have to play as well as you can. "That's what usually happens in links golf. It's difficult in the afternoon, easier in the morning."